The embedded specialist based in Spain’s Basque region, uses XJTAG boundary scan to verify designs, optimise testability, and streamline test engineering. Its vision triggered ULMA to be an early adopter of XJTAG Expert, which combines boundary scan with analog and functional test capabilities in an easy-to-use, portable platform. The fast growing team of embedded experts contributes to the design of system elements such as user interfaces, carrier boards or PCI Express based extension cards and, when required, can take full responsibility for individual modules or a complete system design. The company’s engineers are adept at using boundary scan to test circuit boards all the way from development through to production, and have chosen XJTAG for its ease of use and features that help verify designs and optimise test coverage before committing to hardware. With a clear technical vision, ULMA Embedded Solutions became an early adopter of the new XJTAG Expert system, a portable solution that also incorporates a 200 MHz digital oscilloscope with 10 GSample/s capability, a waveform and function generator, a 200 MHz spectrum analyser and a serial protocol analyser with support for protocols such as CAN, I²C, SPI and RS232. XJTAG Expert can perform analog and functional tests within the boundary scan projects, and its portability allows use in laboratory or field work. It connects to a host PC via two USB connections, and provides a configurable 20-way connection to the unit under test with the ability to supply power to small target boards. The self-contained XJTAG license allows the system to be used on multiple PCs, either on or off site. We can verify new designs and begin developing tests using XJTAG as soon as the netlist is available. DFT analysis is a dependable tool for improving quality. XJTAG also allows tests to be recorded and developed as each project progresses, and ultimately applied to production units. Whenever we receive first prototypes, XJTAG allows us to test all the circuitry connected to the boundary scan chain within seconds. Using XJTAG Expert simplifies our test engineering activities. We can run boundary scan with some analog and functional tests on the same platform. The system builds effectively on our existing investment in XJTAG boundary scan. 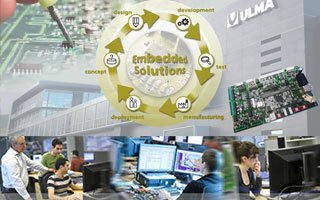 ULMA Embedded Solutions, founded in 2009 in Oñati, Spain is part of Mondragon Corporation, one of the country’s largest corporate groups. It offers services supporting the complete embedded product lifecycle, taking responsibility for any or all stages from concept through design, development, manufacturing and deployment. The company has customers in sectors such as transportation, healthcare, industrial automation and automotive.